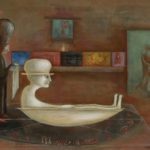 In Mexico, a massive retrospective reveals the magical world of Leonora Carrington. At the time of her death at the age of 94 in 2011, Leonora Carrington was the last survivor of the original generation of Surrealists. 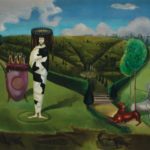 Born in England, she had lived in Mexico City since 1942, when she fled Nazi-occupied Europe along with many of her fellow Surrealists. 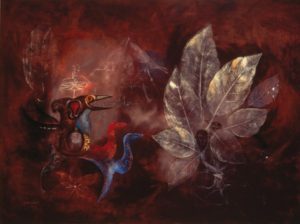 Always enamored of the marvelous and the magical, in Mexico Carrington connected deeply with that country’s indigenous myths, integrating them into her work. 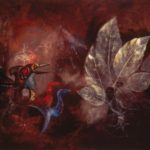 Over time, she became accepted, despite her foreign birth, as a Mexican artist. And while she entered the art world under the aegis of Surrealism and stayed true to its inspiration, she was too independent to adhere to Surrealist orthodoxy. Carrington’s work is figurative and narrative, and the stories she tells belong to the realm of dreams, visions, and symbols. 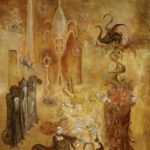 So it’s fitting that the retrospective now on view at the Museo de Arte Contemporáneo de Monterrey (MARCO), in Mexico, is titled “Leonora Carrington: Magic Tales,” and it marks the first time her work has been revealed in all its aspects—painting, drawing, sculpture, theater design, playwriting and fiction, all spanning a period of more than 60 years. Comprising 223 works loaned from public and private collection in Mexico, the U.S., and Europe, the exhibition was curated by Tere Arcq and Stefan van Raay and organized by the Museo de Arte Moderno in Mexico City in collaboration with the Museo del Palacio de Bellas Artes and the Fundación Leonora Carrington A.C. The last in a year-long series of events commemorating the centennial of the artist’s birth, the show runs through February 3, 2019. Born in 1917 to a nouveau riche family in Lancashire, the father a textile tycoon, Carrington rebelled early and often. As her biographer (and cousin) Joanna Moorhead relates in her 2017 biography, The Surreal Life of Leonora Carrington, at the age of 18 the future artist was presented to King George V and Queen Mary as a debutante; long afterward, she recalled the tiara she wore that day as “biting into my skull.” After two years of being pushed into “society,” she had to escape. The escape route presented itself serendipitously at a London dinner party in 1937, where Carrington found herself seated next to, of all people, the German-born Surrealist artist Max Ernst, 26 years her senior. They fell in love immediately and traveled together to Europe, settling in Paris. He called her “the Bride of the Wind”; she said, “everything I learned in art and life I learned from Max.” He introduced her to the circle of Surrealists, including André Breton, who called her “the woman sorcerer” and encouraged her to study magic, alchemy, astrology, the Tarot, and the I Ching, occult subjects that would become a major influence on her paintings and writings. In the chaos of the Nazi occupation of France, Carrington and Ernst were separated, and in 1940 she had a psychiatric crisis that landed her in a mental hospital in Spain. After leaving the hospital, she decided that she needed to separate herself from Ernst in order to achieve artistic and personal independence. While in Spain she married a Mexican diplomat, Renato Leduc, with whom she fled fascism in 1941, first to New York and then Mexico City by the end of 1942. A year later, Carrington and Leduc divorced, and in 1946 she married Imre “Chiki” Weisz, a Hungarian-born Jewish photographer who had once been Robert Capa’s darkroom assistant. Through Weisz, she connected not only with Judaism—see, for example, her painting El baño de Rabbi Loew, which depicts an imagined scene involving the wonder-working 16th-century Prague Kabbalist who made the Golem—but with another expatriate community of artists and unconventional thinkers. Among these were the painters Wolfgang Paalen and Remedios Varo, the poet Benjamin Péret, the photographer Kati Horna, and the filmmakers Luis Buñuel and Alejandro Jodorowsky. The 1940s and ’50s were a time of major creative achievement and career success for Carrington. In 1945 she befriended the English collector and arts patron Edward James, a major supporter of Surrealists including Salvador Dalí. James got her her first solo show, at the Pierre Matisse Gallery in New York in 1948. The next year, Carrington read Robert Graves’ new book The White Goddess, which was a life-changing experience and a major influence on her work. Graves ambitiously attempted to excavate a world before patriarchy when goddess worship and reverence for women’s powers were the basis of culture. Graves’ thoughts may not have been entirely news to Carrington; her 1942 painting Green Tea (La Dame Ovale) looks very much like a portrait of the White Goddess herself. Carrington began painting scenes of female figures engaging in magical rituals or acts of prophecy. Alchemy, described by its adepts as “child’s play and women’s work,” featured prominently in this iconography, as in The Chrysopeia [i.e., gold-making] of Mary the Jewess (1964). Sometimes in Carrington’s work, alchemy is identified with the archetypally female task of cooking, the alchemical laboratory becoming a humble kitchen. In these as in most of Carrington’s painting, the figurative elements are presented in an uncanny, abstracted space whose dimensions and illumination are unlike those of this world. 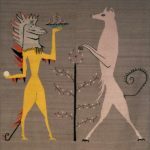 Another major source of inspiration to Carrington was the animal kingdom, with which she identified intensely, almost shamanistically. The painting Iguana and Fox (1948–58)—dedicated to her patron Edward James—in which the animals are portrayed as having humanoid bodies and two-legged stances, is typical of this aspect of her work. Mexico, often considered to be inherently Surreal due to its magical mixture of cultures and everyday marvels, was the perfect environment for Carrington’s artistic development, and she felt that her Irish-Celtic background resonated with the Pre-Columbian myths of Mexico. Ironically, the Mexican muralists came to reject Surrealism for political and nationalist reasons, and that had ramifications for Carrington when David Alfaro Siqueiros saw to it that a mural commission she had won from Mexico City’s National Medical Center was cancelled. However, she eventually did execute a mural for the Mayan Room in the Museum of Anthropology, titled The Magical World of the Mayans (1964). Drawings and studies for this mural are on view in a special section of the exhibition. The exhibition also has sections dedicated to Carrington’s political and feminist activism beginning in 1968, her fiction writing, and photographs of her and her circle. As a writer she is best known for the novel The Hearing Trumpet (published in 1970 though written earlier), which combines visionary fantasy and social satire, but she also wrote plays and short stories. Her first story, The House of Fear, was published in France in 1938 with collage illustrations by Max Ernst. Among the photos on view are ones by Chiki Weisz, Kati Horna, and Lee Miller, another Surrealist-influenced woman who began her artistic life as a “muse” and quickly outgrew the role to become an artist.